Labyrinth of Lies, directed by Giulio Ricciarelli, from a script by Ricciarelli and Elisabeth Bartel, is a fictionalized depiction of the events leading up to the Frankfurt Auschwitz Trials of 1963-65. The story begins in Germany in the late 1950’s. Johan Radmann (Alexander Fehling) is a young prosecutor who gets involved in the case of a school teacher who is accused of having been an SS officer at Auschwitz. The case leads Radmann to discover that other former Auschwitz officers and guards are living free. He persuades the Attorney General, Fritz Bauer (Gert Voss) to let him begin bringing criminal cases against these people. Radmann encounters resistance, both from the government and from his fellow lawyers against the prosecutions. The German title of this film, Im Labyrinth des Schweigens, literally translates as “In the Labyrinth of Silence”, which is a more accurate title. It becomes clear that the problem is not so much lies as the fact that people simply refused to discuss what had happened. The film is implicitly critical of the Adenauer government, with its “time to move on” philosophy. (At one point the film suggests that some members of the West German government helped Josef Mengele to avoid capture.) The result of this is virtually a form of historical amnesia. In one scene, someone asks some young Germans if they have ever heard of Auschwitz, and they answer no. During his first interview with an Auschwitz survivor, Radmann is astonished to learn that hundreds of thousands of people died there. “What did you think it was, a summer camp next to a lake?” a survivor sarcastically asks him. 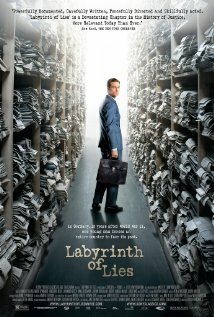 The main problem with Labyrinth of Lies is its heavy reliance on standard storytelling techniques. For example, it follows the time-honored Hollywood tradition of including a romantic subplot: Radmann has an affair with a free-spirited girl, Marlene (Friederike Becht). These scenes are in and of themselves not objectionable, but they seem somehow inappropriate within the context of the film’s disturbing subject matter. There are also some dream scenes in which Radmann is shown following Mengele through the latter’s laboratory. These are clearly meant to be emotionally powerful, but they seem merely trite: we’ve seen these sorts of dream scenes too many times in other films. This raises the question of whether standard storytelling techniques are adequate for dealing with such an enormity as Auschwitz. Despite its flaws, Labyrinth of Lies is a revealing portrait of post-World War II Germany.